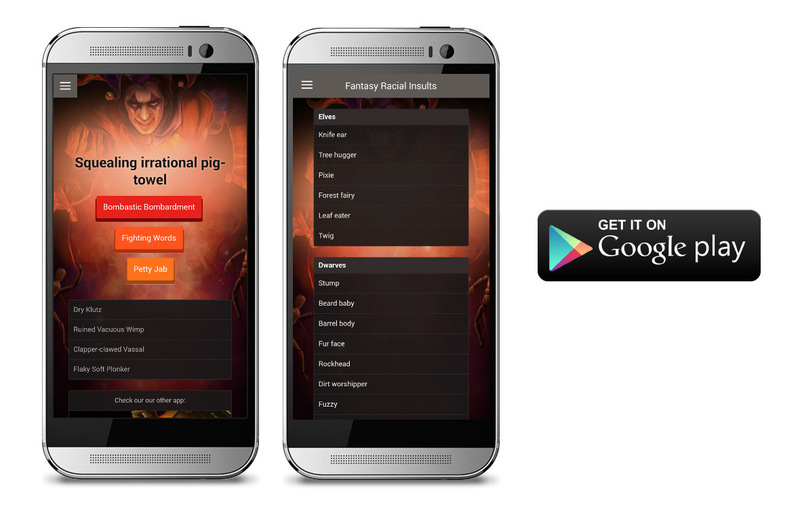 Fantasy Insult Generator is free and available for Android. It’s a fun little app that generates ridiculous insults, that are a mix between Shakespearean, personal creations, and fantasy-specific words and phrases. This is my second published app, in collaboration with Ixie Studios, that’s geared towards gaming and RPGs. The app was created using the HTML-based Ionic Framework, which was very enjoyable to use for the first time. Its UI elements and command line setup made the prototyping stage fairly quick. The framework’s use of AngularJS to structure the application was new to me, but mostly painless to pick up. Its approach felt much more organized and appropriate for apps than some other frameworks I have used before (no more jQuery Mobile for me). I plan to use it again for future projects. Advertising is integrated using AdMob, and the ability to send your insult is thanks to the cordova plugin Social Message.